In the meantime a lot has changed. By now there are more than 30 CZTs in Germany, me being one of them. I travelled to Providence this spring and enjoyed every moment of CZT#26 seminar. What a great experience! A special hello to all my mates from the seminar!! As the diva - who has challenged me for so many times - takes a break, I’m happy to challenge you today. I hope you are going to have some fun! Weekly Challenge #327: "The Diva dancing in Lisbon"
Recently I visited Lisbon, the capital of Portugal. The city is just beautiful! There are patterns everywhere. Houses are covered with tiles. There are floral patterns as well as geometric ones. Some tiles are just blue others are colorful. I loved to just look and then sit and tangle with a nice cup of coffee in front of me. I tried to deconstruct some of the patterns I found as you can see in the collage. There was one tile in a museum I especially liked. I call it the “Lisbon fragment”. You can read more about it, find the stepouts and some variations here. The Lisbon Fragment is so cool! I visited Lisbon about 8 years ago, but never came across the Lisbon Tile Museum. Of course, that was before I found Zentangle and became aware of patterns everywhere. P.S. : Your command of English is wonderful. I'm always impressed by multilingualism. I am really intrigued by this, Henrike, and know I will spend several hours exploring the possibilities. Thanks for sharing! Thank you Henrike for this challenge. I like your tangle, tried it several times before starting my tile, but still it is not really how it should be. But, it is what it is and I liked working on it. 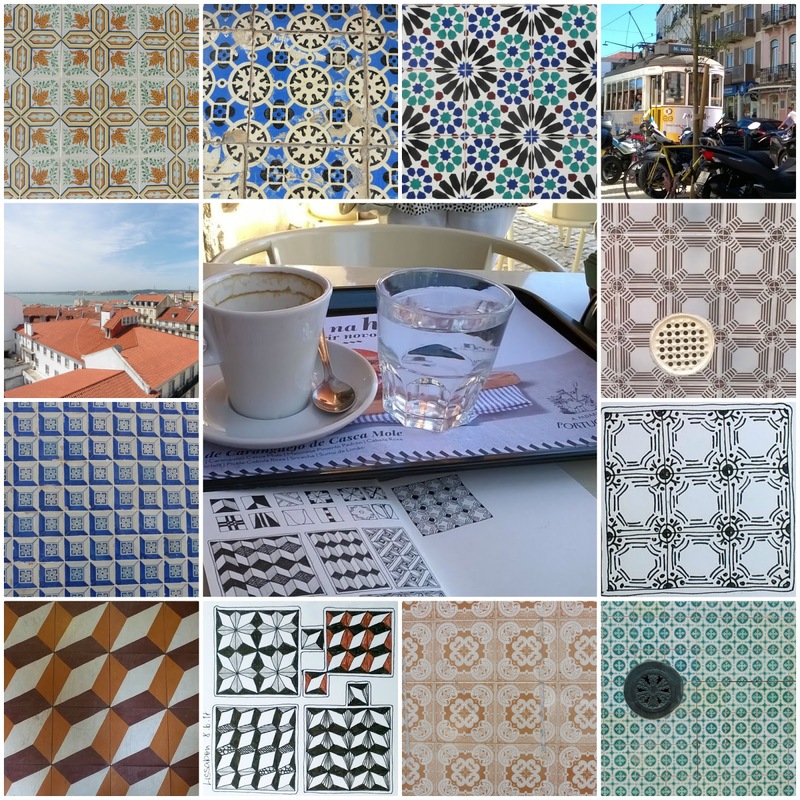 Your tile is beautiful!!! Thank you Henrike, I checked out your blog, you tangle beautifully. Diva dance sweeping across your zendala tile picks up the tempo with joyous movement. I had a bit of bother with the step outs for this one, so I think I may need more practice. I like it when other people do it but haven't succeeded myself yet. Thank you for hosting this week. I had fun on my first attempt. Shaky hands but the next should be more stable. thanks too much for the nice post. Thank you Henrike, everyone scared me with this so I did two small practice tiles on small paper and it turned out great.....then when I tried to put it in my book Yikes, took 3 tries before I got it right. 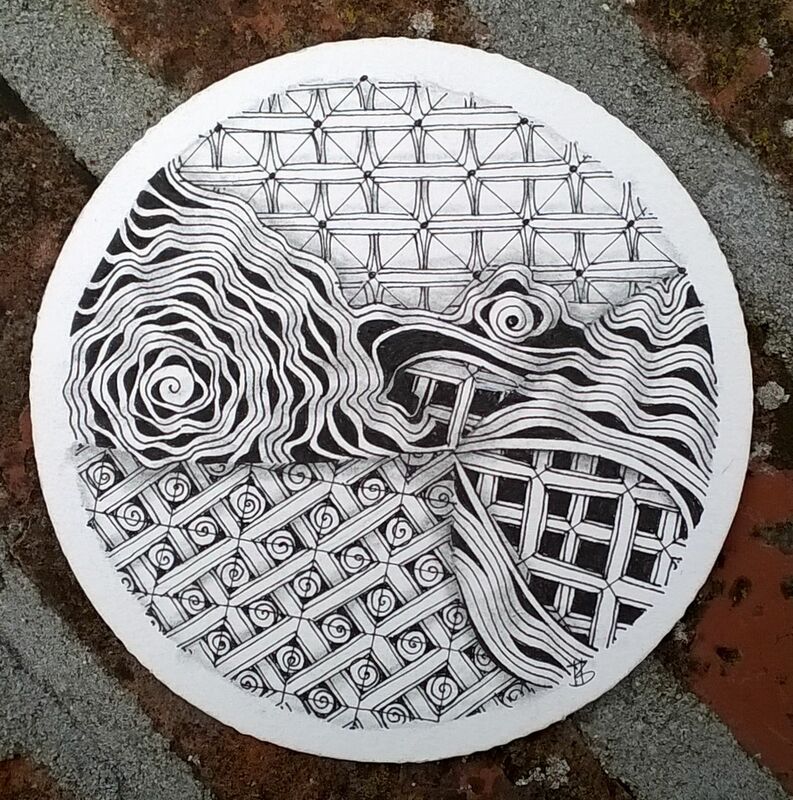 (No mistakes in Zentangle????? haha). Too bad my photos always have the side with the light showing up not as dark as the Tangle really is. I had so much fun with this challenge. Thank you !!!!! Thank you Henrike and Laura for thi challenge. I enjoyed a lot for my 1st time in this weekly challenge. A good way to begin! Thank you for this challenge, Henrike and Laura. These patterns together I like very much. For me it was the first challenge in which I participated.